The state bird of IA, NJ, and WA, the American Goldfinch is also found all over the United States. The American Goldfinch is a friendly, sparrow-sized songbird. The males have distinctive bright yellow coloring that makes them easy to identify. American Goldfinch nests are meticulously made in trees, bushes or birdhouses hanging between 5-20 feet off of the ground. Unlike most birds, the female American Goldfinch waits until summer to nest, when she lays up to six light-blue eggs. American Goldfinch love nyjer (also called thistle) seed; however, they will also eat protein-rich seeds from sunflowers and wild flowers. Imagine a bright, colorful, bouncy finch singing in your yard and you have a good idea of what an American Goldfinch is like. The American Goldfinch is a favorite of backyard birders because of its engaging song, stunning colors and willingness to eat at almost any thistle or njyer feeder. Often described as an acrobat because of its ability to hang upside down on almost anything that has food, American Goldfinch are a lot of fun to watch. To attract an American Goldfinch, all you really need is a finch feeder and a little patience. These popular birds are found across the United States and, the males especially, are easy to recognize during the breeding season. The small American Goldfinch can look quite different throughout the year. Like most birds, the male American Goldfinch is the more colorful of the pair. In spring and summer the bright yellow colors of the American Goldfinch, combined with it's black wings and white edges, are unmistakable. However, in winter the yellow colors give way to a duller look in both the male and female birds. While they are going through this transition (called molting), they may look a little odd. When American Goldfinch are molting, their feathers may fall off and their beaks can even change color. It's not uncommon to see a female American Goldfinch being chased by a male bird (or two or three) prior to the breeding season. This game of "tag" helps the female choose her perfect mate before they start to build a nest. Goldfinches are different from other songbirds because they breed much later in the season than most of their feathered friends. Perhaps because these birds rely heavily on thistle, milkweed and seeds from grasses and flowers for food and even nesting materials, female American Goldfinches tend to wait until mid to late summer to make their nests. You’ll most often find them nesting in the fork of a tree near an open space (like a field or roadway). American Goldfinch nests are in many ways an architectural work of art. The female bird builds a very sturdy nest out of various plant materials, and then lines the nest with thistle or plant down to make it unusually waterproof. American Goldfinches have also have been known to use spider webs to line their cup-shaped nests. You can encourage nesting by offering a small birdhouse (around twelve inches tall and six inches by eight inches deep). American Goldfinches need an entrance hole that is around 1.5 inches around, and will do best in a home mounted 5-20 feet off the ground in a tree or bush. You may also be able to tempt American Goldfinches to nest in your yard if you plant thistle or sunflower plants, or if you have a naturalized area in your yard that is filled with coneflowers or other seed-rich wildflowers. Like all birds, American Goldfinch are also attracted to water. A plastic plate with fresh water, or a birdbath, will attract a variety of different birds. A female American Goldfinch will lay as many as a half-dozen light blue eggs, which she will incubate for an average of two weeks. Her male partner will bring her food throughout this period, caring for her as she takes care of the eggs. Once the eggs hatch, the babies will eat a mixture of regurgitated seeds and an occasional insect. A couple of weeks after hatching, the fledglings are ready to leave the nest. Often the female American Goldfinch will build a second nest while the fledglings are still living nearby in the first one. Her mate will feed the first family of nestlings as she gets ready for a second brood. After all of the nestlings have grown up and left the nest, American Goldfinches will often join a mixed flock of birds that may include pine siskins, purple finches and redpolls. As they begin to molt again, the male American Goldfinch lose their bright yellow colors for winter and again look more similar to the female birds. When it comes to feeding American Goldfinches, there is nothing they like more than thistle (also called nyjer) seed. These small birds adore this equally tiny bird food, and eat from specially-designed finch feeders that keep the small thistle seed from falling out of larger sunflower seed feeders. Finch feeders may also help keep larger nuisance birds (like European Starlings and House Sparrows) from eating at the feeders by placing the perches above the feeding ports for the bird seed. Unlike most birds, American Goldfinches can eat upside down. This allows them to eat at bird feeders that many other birds just can’t use. Mesh bags: These are the simplest types of thistle seed feeders because there are no feeding ports. The birds simply grab the bird food right through the mesh bag and then eat the thistle or nyjer seed. 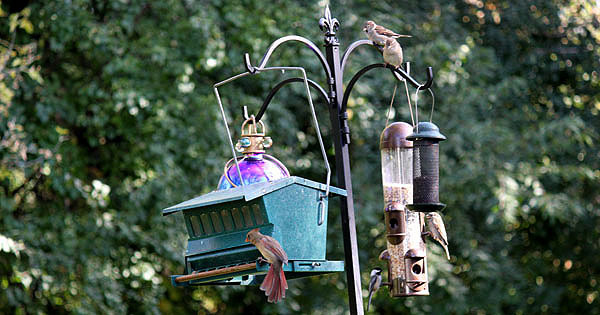 Hopper or tray feeders: Many hopper feeders are also squirrel-proof, which makes them a favorite of bird watchers. 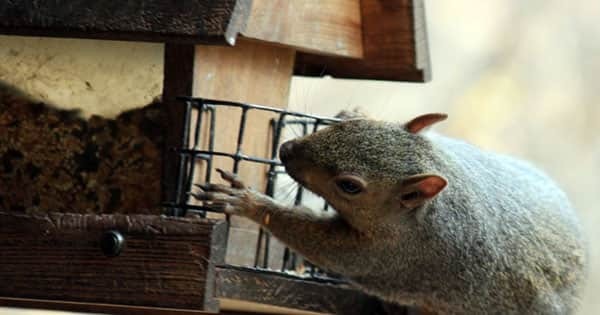 Squirrels can be aggressive at bird feeders and often scare off smaller songbirds that try to feed. 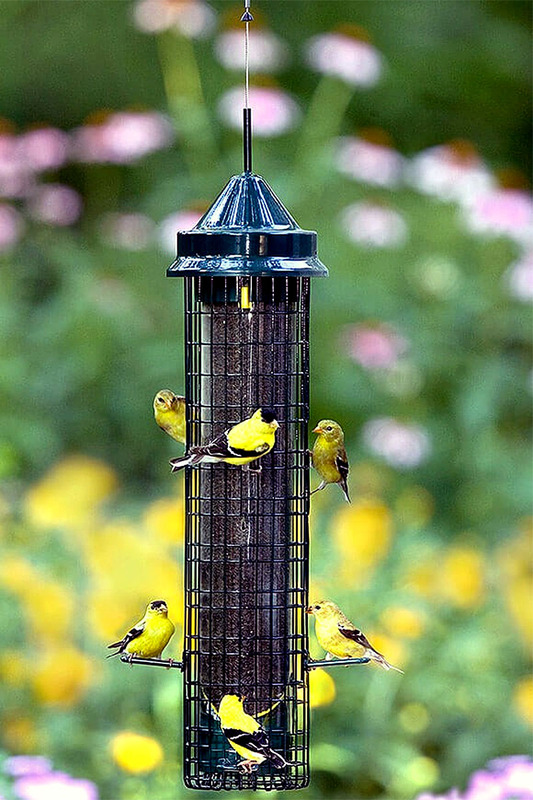 Squirrel-proof hopper feeders can often be adjusted to allow lightweight American Goldfinches and other songbirds to eat while keeping squirrels and heavier birds away from the bird seed. Tube feeders: Named for their simple tube mechanisms, these types of bird feeders can be squirrel-proofed (or not). 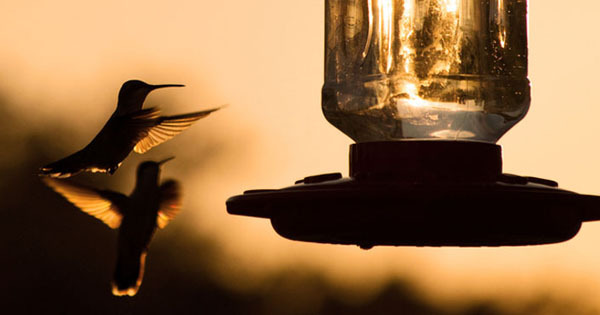 Some require the birds to cling on the feeders, hang upside down or climb through a cage to get to the thistle seed. American Goldfinches are agile enough to eat in any of these positions, so they are commonly found at tube feeders. In most of the United States, you can find American Goldfinches year-round. Water is as important to birds as it is to us so, if you have the space, put out a little birdbath for them to use. Not only will the American Goldfinches like it, but you never know what other birds you will see. There are some areas where these engaging little songbirds migrate, but for the most part once you have attracted them - you will be able to enjoy American Goldfinches throughout the year. Wood, T., Williamson, S., and Glassberg, J. 2005. Birds of North America. Sterling Publishing, New York. Alderfer, J. eds. 2006. National Geographic Complete Birds of North America. National Geographic, Washington DC.